Ridley Scott’s film Alien is arguably one of the best science-fiction movies of all time. It was released in 1979 and immediately gained a cult following. It was immensely frightening–“In space, no one can hear you scream”–with a breakout performance by Sigourney Weaver. The seminal film’s dark, detailed, claustrophobic atmosphere and undeniably Lovecraftian horror elements made it stand out among all other sci-fi flicks. It received Academy Award nominations in several categories but won only one, for Best Special Effects. The mastery of those effects could not be denied. 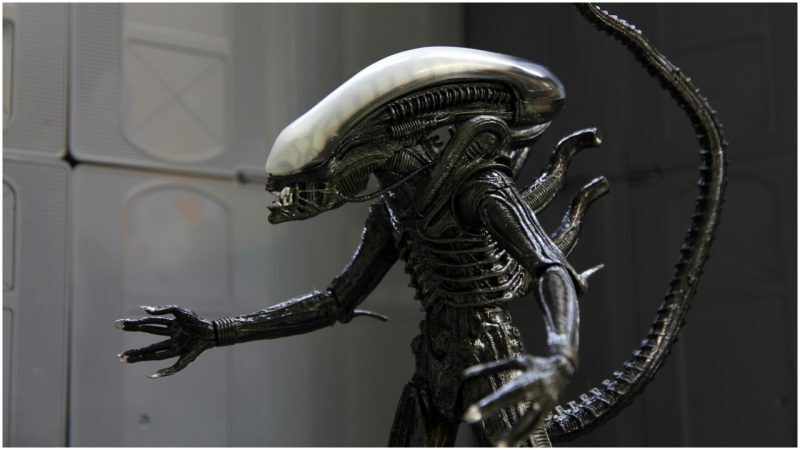 Although many prominent artists and designers collaborated with Ridley Scott to design Alien’s unique look, the film’s visual identity is mainly a result of the efforts of Hans Rudi Giger, a Swiss surrealist painter with an exceptionally macabre imagination. Dan O’Bannon was the film’s screenwriter, co-producer, and visual- effects supervisor; he collaborated with director Ridley Scott on the concept of the film. During the initial stages of production, the two came up with most of the film’s plot, and O’Bannon and his team of designers developed the visual identity of the Earth-related spaces and objects: the legendary spaceship Nostromo and its interior, the cryosleep chamber, the narrow and claustrophobic corridors, and the dimly-lit air ducts known to every true sci-fi fan. However, they still needed a visionary who would help them in designing the monster that would become the central element of the film. O’Bannon stumbled upon the “Necronomicon,” the first published compilation of Giger’s paintings. He was amazed by Giger’s intricate and highly detailed works, his innovative use of the airbrush technique, and his dark and twisted imagination. O’Bannon presented the “Necronomicon” to Ridley Scott, and Scott immediately hired Giger to work on the design of the film’s titular monster, later named the “xenomorph.” Although Giger wanted to create a unique design for the creature, Scott was particularly fascinated by the paintings “Necronomicon IV” and “Necronomicon V” and instructed Giger to adapt the creatures from these paintings. The paintings feature grim and awkwardly shaped humanoids surrounded by bleak and sinister biomechanical landscapes; the humanoids are eerily sexualized, which makes them even scarier. After Giger was hired, he worked at Shepperton Studios for several months and hand-sculpted several creatures. He first created the “facehugger,” the repulsive alien parasite which lays its offspring inside of human hosts. When he created the xenomorph, he purposely designed the creature to have no eyes, because he thought it would be more frightening if nobody knew in which direction it was looking. Ridley Scott was so amazed by Giger’s design that he hired him to create set designs for the film, including the alien landscape of the planet LV-426, the derelict spacecraft, and its interior in which alien eggs were found, and various alien-related props. Giger and his then-wife Mia Bonzanigo spent several months working on the projects at Shepperton Studios and the outcome was stellar: the uniqueness of Giger’s visionary designs became the defining feature of the film’s popularity and cult status. Giger’s designs were used in the filming of all the films of the Alien franchise, but James Cameron’s Aliens and Jean Pierre Jeunet’s Alien: Resurrection used only the design of the xenomorph and didn’t credit Giger as the principal designer. In 2012, Giger once again collaborated with Ridley Scott on the film Prometheus, and, while creating the film’s visually impressive sets, Scott used many of Giger’s original concepts from the late 1970’s that were not included in the original Alien. Aside from the Alien franchise, Giger worked as a set designer on several prominent films. He was the principal designer for the second installment of the horror classic Poltergeist, he designed the malevolent human-alien hybrid for the cult sci-fi film Species, and even created a radically different biomechanical incarnation of the Batmobile for Joel Schumacher’s Batman Forever. Sadly, Giger’s vision of the vehicle was probably too twisted for the film, and it ended up being replaced with a regular Batmobile. Giger left behind a formidable legacy of visionary art. He produced numerous paintings and drawings, designed covers for several seminal musicians, and even supervised the creation of two “Giger Bars.” Those bars’ interiors reflect the dark, sinister, and strangely beautiful depths of Giger’s imagination.